International Meihua Quan Federation (IMHQF) of China appoints Master Jean Phoenix Le Grand of Lost Legacy Systems USA as Ambassador to the organization. Sifu Le Grand has been studying martial arts for over 44 years and has trained under some of the most legendary American masters. He was born into a family of martial artists and began his training at a young age in 1974. His Grandmaster and Uncle, Tiger Jude Innocent, was a student and co-founder of the New Shaolin Boxing Association with the famous, Carter Wong, star of 18 Bronzemen/7 Grandmasters and Big Trouble in Little China. Le Grand was born in Haiti and grew up in the Flatbush neighborhood of Brooklyn, NY. In 2003, he moved to Florida and brought his art with him. He is a well known martial artist, spokesperson, stunt actor, independent film maker and personal trainer. Over the last few years, he has been instrumental in promoting the art of Meihuaquan (Plum Blossom Fist) and exposing this once secretive style to American audiences through his Lost Legacy Martial Arts academy in Florida. In 2017, he traveled to China to train Meihuaquan under 17th Generation Disciple, Founder of the International Meihua Quan Federation, Vice-President of the Chinese Meihuaquan Association and Executive Director of Mei Boxing Association under China Culture Administration Association, Shifu Du Weijun (monastic name Shifu Yanjun). He also had the opportunity to meet and train with the most famous Meihuazhuang master and lineage holder, Grandmaster Han Jianzhong. Master Han’s father was one of China’s national heroes and is responsible for brining Meihuazhuang out of the villages and into the mainstream. Sifu Le Grand has committed to the preservation and cultivation of Meihuaquan culture and has a accepted an Ambassador role in the IMHQF to further the cause. He is helping organize the first IMHQF Seminar and Kung Fu Tournament in the United States in 2018. It will be held October 12-14 in Fort Lauderdale, FL. Songshan Shaolin Traditional Wushu Academy is proud to announce cooperation with our first Kung Fu school in the USA, Lost Legacy Systems Traditional Mixed Martial Arts in Lauderhill, Florida. Like most martial artists, we all dream to visit and train at the original Shaolin Temple as it is widely considered to be the birthplace of Kung Fu and the most famous place in the world for martial arts. 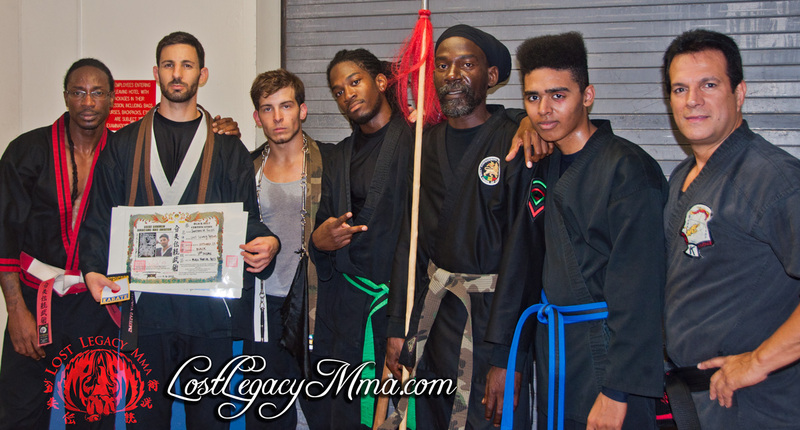 In August of 2016, Sifuei Jonathan M. Fields, 4th Dan Chief Instructor of Lost Legacy Systems Traditional Mixed Martial Arts School in Lauderhill Florida, USA had the opportunity to fulfill his lifelong goal of visiting the temple. He was able to stay at the Songshan Shaolin Traditional Wushu Academy and train under the supervision of 34th Generation Shaolin Warrior Monk and 17th Generation Meihua Quan, Shifu Shi Yan Jun. Besides martial arts, Jonathan is a student of Traditional Chinese Medicine and organized a group of 9 people from his university to come study with the Doctors at the Shaolin Medical center. During his time at the academy and the temple, he was able to demonstrate to shifu Shi Yan Jun his skills and as an instructor, self-defense techniques, sanda sparring, qigong and understanding of Chinese Medicine. Although the visit was only 3 weeks long, he was able to learn and show ability to teach Tai Chi, QiGong, Meihua Quan, Sanda and Qin Na. The trip made such a large impact that he was committed to bringing home his newly gained knowledge and sharing with his instructors and students the traditional Shaolin way. He also made a pact to return next year to further his education in the Shaolin arts and Meihua Quan. Thus was born the cooperation between Lost Legacy Systems and Songshan Shaolin Traditional Wushu Academy. Lost Legacy is recognized as the first official partner in the USA and will be teaching authentic Shaolin Wushu forms, Meihua Quan, Tai Chi, Qin Na, Sanda and QiGong. Students will be able to become members of the academy with ID cards and have an opportunity for grading in the future with Shifu Shi Yan Jun when he visits the United States for seminars. The Shaolin curriculum will also be standard mandatory teaching for all Lost Legacy students. In 2017, Sifu Fields returned to the Shaolin School with Master Le Grand, where they stayed and trained for 4 weeks. They then spent a week training Meihua Quan with the legendary Grandmaster Han Jianzhong in Beijing.